CSA Deliveries Begin in June! Reserve Your CSA Shares Today! Community Supported Agriculture or CSA is a partnership between a local community and a local farm. As your local organic farmers, we pledge to grow and deliver beautiful food raised on our farm. Members of our community join our CSA and receive a share of the harvest. Your purchase is a vote for local organic agriculture. You receive delicious food produced organically on our farm, harvested fresh and raised with respect. In return, we receive a secure income to help keep the farm up and running. As a member of our CSA, we’ll follow the growing season together. 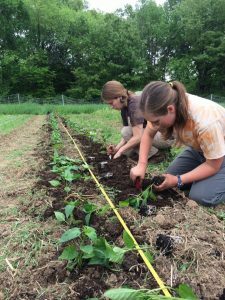 If you are new to a CSA, you probably don’t realize what a rollercoaster ride farming can be from June – November. You soon realize what it takes to run an organic farm. We’ll keep you up to date about the happenings on the farm – the first tomato, the birth of young calf, the arrival of baby chicks and the many beautiful stories throughout the season. Of course, there will hardships as well – tough weather, an early frost. Good and bad…there are great stories happening every day on our farm. What our customers usually say after being a shareholder is they never realized what it takes to grow food. You definitely learn how real local food is produced through the eyes of those actually doing it – we, the farmers. You will develop a true appreciation for food that tastes wholesome, fresh and full of energy. The difference between a real BBF tomato and a store bought imposter is…well…you just have to try it. Our food is a sensory explosion of flavor, aroma, texture and pleasure. Everyone should be so lucky to eat real food. Join us in 2019 and start your real food journey today. 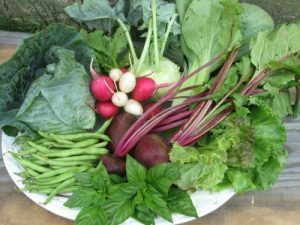 Full Season Share – Receive a box of vegetables every other week from June – November for 12 total deliveries. All vegetables and herbs that fill our shares are grown on our farm. Each box contains 6-8 items along with a Newsletter containing Farm News, Recipes and suggestions for using the food. Deliveries can be rescheduled during the season so you don’t have to miss a delivery when you’re away. Purchase Online or by mailing in your 2019 CSA Sign Up Form with payment. Full Season Share – Receive 1 dozen eggs every other week from June – November for 12 total dozen. Custom Share – Choose the weeks and how many dozen you receive. 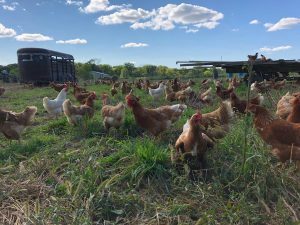 The Pastured Eggs that fill our shares are produced by our hens on our farm. Full Season Share – Receive the meat share of your choice every month from June – November for 6 total deliveries. Custom Share – Choose the month(s) you receive a delivery. 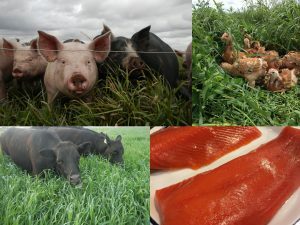 All Grassfed Beef, Pastured Chicken and Pastured Pork are produced on our farm.